Delhi Development Authority has officially issued a recruitment notification to fill vacant posts of various Assistant Executive Engineers through GATE 2019. 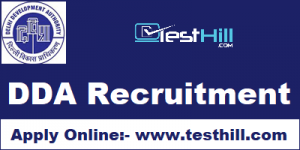 DDA AEE recruitment 2019 initial date to apply online is 10th April 2019. Therefore, applicants can hurry to fill the DDA AEE recruitment applications. In addition, candidates will have to fill the application on or before the last date i.e., 09th May 2019. Better applicant should have a qualified gate score to be present for the DDA AEE recruitment. In order to know more about DDA AEE recruitment 2019, interested candidates can check all the details from below given table. Short Info: Delhi Development Authority, Recruitment Cell has released the official notification regarding DDA Recruitment 2018-19. There are total 217 posts for Surveyor, Junior Law officer, Junior Engineer, Senior Law Officer/Asst Director Officer/Assistant Director, Deputy Director (Architecture / Planning), Assistant Executive Engineer (Civil/Electrical/Mechanical and other posts. Candidates who want to be anyone from given respective posts can apply for this recruitment. This is a good chance for those who want to work in the government sector. For Assistant Executive Engineer (Civil/Electrical/Mechanical), starting date is 1st January 2019. Applications have started on 26th December 2018. Candidates must apply for this recruitment before the last date which is 15th February 2019 for Assistant Executive Engineer(Civil/Electrical/Mechanical) and 22nd January 2019 for rest all posts. Interested candidates must be sure about their eligibility. they are advised to check the official notification with respect to know about the eligibility criteria. We have also provided the eligibility criteria on this web page. So, interested candidates should read this article until the end. DDA department recently released an official notification regarding DDA Recruitment 2019-20. There is a great huge rush want to apply for this recruitment. They all are suggested to check their eligibility criteria. They can check it from the official notification which is available on the official website. We also have provided the official notification link on this page. You can check it from here directly. Candidates need to go to the official website to apply for the DDA Recruitment 2019. They can apply from our page also. We are presenting a suitable link to apply for the respected posts. Candidates are advised to read this whole article entirely to know about all the important information details. They should remember that they can apply only in one condition if they would be eligible in all respects.